Despite my decision to outsource most of the cooking for last Friday’s dinner party, I did manage my time well enough to put a few homemade dishes on the table. I think a dinner party should be about enjoying time with your guests, not slaving over a hot stove. So if time doesn’t permit me to get dishes done ahead of time, I have no qualms about letting someone else do the work for me. I also have no shame about letting my guests know that, no, I did not fry up all that chicken; it came out of a red and white bucket. My time is at least worth an order of 16 piece extra crispy to go. No, my goal was to spend an evening at the table, not the stove. Because my guests that night were collectively the most hysterical people I have ever met. And when you put them all in the same place, it’s one hell of a show. We all used to work together, and we had the most fun you could possibly imagine. It was one of those rare alignment of planets where everyone’s personalities worked off of everyone elses. We laughed. A lot. Not only did we work together, but we liked each other so much that we socialized. A lot. And then as these things go, we moved on to other jobs. The get togethers got more infrequent and ultimately our paths stopped crossing. But time is a funny thing because even though it has been eleven years since I saw these people on a daily basis (I was the first to leave that office), put us all together and it’s like not a day has passed. Those years just melt away and once again we’re those younger versions of ourselves. I’d swear that we collectively possess the power of a time machine. It was dessert that brought past and present together. When we had laughed and drank and laughed some more, and when our evening was closer to the end than it was to the beginning, it was time to come back to the present, courtesy of Mark Bittman. No, he wasn’t a guest but he was at the table in the form of his No Bake Cheesecake. I deviated from his instructions and pressed the crust into a 9″ round cake pan lined with foil. After the filling was added and had chilled for a day (including a quick 30 minutes in the freezer before plating), I used the foil to pull it out of the pan and slid the cake onto a serving dish. Make this a day or two ahead and check one more thing off your to do list for your next get together. Combine crushed graham crackers, nuts if using, and melted butter. Press evenly into bottom of an 8- or 9-inch square pan to form a crust about 1/4-inch thick. Put in refrigerator until ready to use. 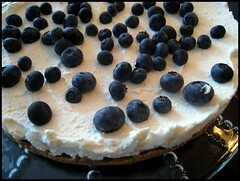 I remember making something like this, no bake cheesecakes were a bit of a rage there for awhile weren’t they. Good memories, used to indulge in these little babies from time to time. Might make one over the holidays. Thanks for sharing Wendi.